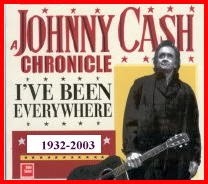 ORIGINAL SONG: "I've Been Everywhere", by Lucky Starr, covered by Hank Snow, Johnny Cash et al. PARODY COMPOSED: see part #1 of this parody-song by Giorgio Coniglio, June 2013; further verses were added, to create this reprise in December 2015. This song is dedicated to the memory of my father. Apart from a fierce determination to retain independent mobility, he was a highly responsible family man and bore little resemblance to the footloose and perhaps rascally hero of this piece. He was however an ardent admirer of rhyming patter, and would likely have enjoyed this song. 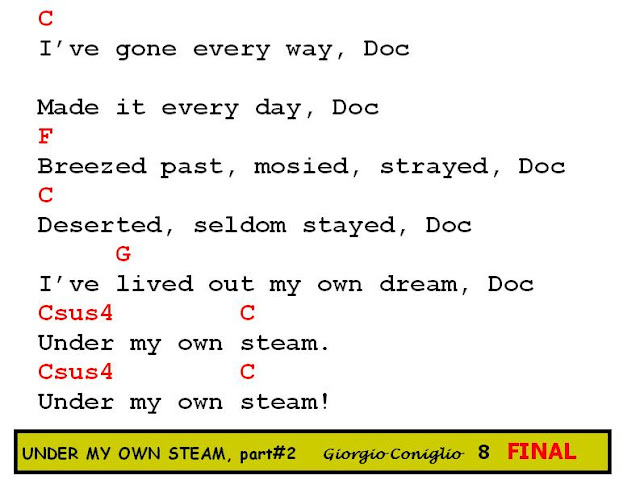 You can view the lyrics and commentary (without images or chords) displayed on a parody-lyrics website at AmIRight.com Post "Under My Own Steam"
I found another nice person, the Geriatric resident. Because I'd left out a lot ot ways that I got 'round to sow my oats. Fled absconded, disappeared, undulated, tailed and shadowed. Pursued escaped, hunted shunted, zigzagged bee-lined, rounded edged. Under my own steam . 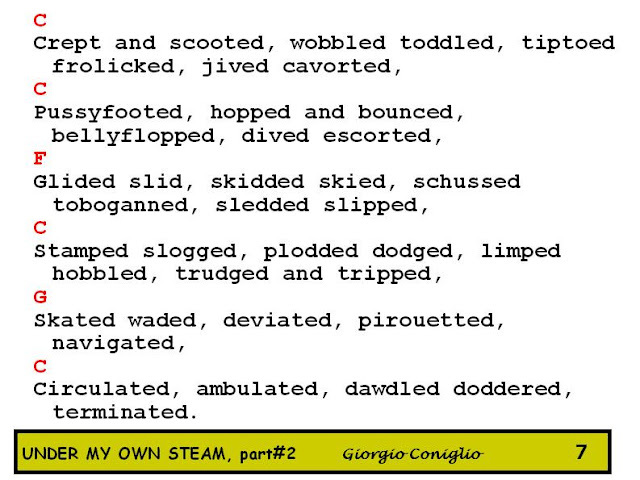 Circulated, ambulated, dawdled doddered, terminated. I like doing this song with progressive key changes, as in the Lucky Starr versions of the song; or if you like you can keep it simple like Johnny Cash did, and leave it all in the key of C.